Come celebrate the completion of one of Vancouver’s best public realm treasures. The Seaside Greenway that connects downtown’s Seawall and False Creek with Jericho Beach is ready to be biked, walked, or rolled – and may the best costume or decorated bike win! What will you find? In the parks along the route towards Jericho Beach, you can listen to live music, zip yourself into a giant petal (really! ), feast from your favorite food trucks, get crafty with the kids, play all sorts of lawn games, strike a yoga pose and more. Bring your picnic lunch and find a shady spot amid the festivities and don’t forget plenty of water and sunscreen. A bike valet will be available in Hastings Mill Park sponsored by BEST. 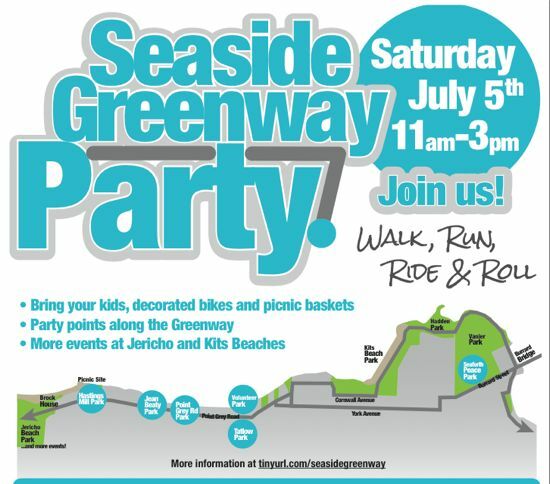 Continue west down the Seaside Greenway route to check out Brock House’s Summer Fair, Jericho Sailing Centre’s 40th Anniversary Celebration (we’ve heard rumours that there’s cake!) and MEC’s Paddlefest on Jericho Beach. Also, don’t miss the volleyball tournament on Kitsilano Beach on the way down. This celebration for everyone is supported by many, including the Vancouver Public Space Network, HUB Cycling, the UBC AMS Bike Co-op, BEST, area neighbours and others. Tagged with: ams bike co-co, Hub, seaside greenway. ← Thanks! Great campaign, disappointing results for our team!